Audio Analogue Maestro review | What Hi-Fi? Audio Analogue has something of an uneven track record with us. Its more affordable products have been a little hit and miss over the years, with true superstars like the original Puccini SE integrated amplifier (from around a decade or so ago) being in a distinct minority. 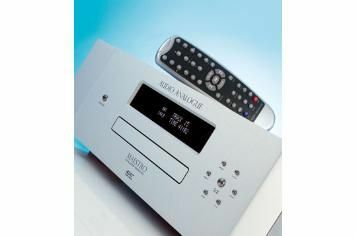 Yet, in recent times the company has started to attack the high-end market – with considerable success – with its Class A integrated amp and pre/monobloc combination. The latter leaves little change from £20k, mind. It's from this DNA that the Maestro SE CD player emerges. This chunky machine might share its name with some less-than-distinguished spinners, but it's a far more serious effort than the company has attempted before. First impressions are almost all positive. The player looks elegant and expensive – just the way most high-end buyers like it. There are neat flourishes such as the imaginative control button layout on the front panel, and there's little wrong with the large, clear display. The only bit of bad news is the downmarket remote control: there's really no excuse at this price level. The player's connections are par for this class, bar an important extra. Analogue outputs include the standard balanced XLR and unbalanced RCA. Digitally, there's coaxial in and out. While the digital input will accept signals up to 24bit/192kHz, limiting it to coaxial is a strange choice. Optical and USB would have been more useful, and extended the Maestro's compatibility to a wider range of sources. It's a shame, as the on-board DAC is far better than that used in most conventional products. We like this player, we really do. But why does Audio Analogue have to make it so complicated to optimise? Delve into the Maestro's set-up menus (yes this is a CD player with set-up menus), and there are tweaks aplenty. You can start with PLL mode, which cleans up the internal clock (shouldn't this be standard?). In this mode you can also upsample from CD's 44.1kHz all the way to 176.4kHz, with a step of 88.2kHz in between. If you decide to bypass the PLL option and go to SRC (Sample Rate Conversion) mode, the options are – take a deep breath – 44.1kHz, 48kHz, 88.2kHz, 96kHz, 176.4kHz and 192kHz. Confused? We don't blame you. The two modes are similar, and while the ability to fine-tune is welcome, it can get confusing. Our favourite was PLL on with the sampling rate set to 44.1kHz – it gave the best compromise between refinement and attack with our Bryston/ATC reference system. Oh, and switch off the digital output. The sound is crisper and more refined if you do. its slam, refinement and insight come to the fore. It paints a broad, nicely-distanced sound stage and gets tonality just right. Complexity is no problem, either: it sounds composed no matter how simple or intricate things get. Detail is good rather than great, but there's little here to spoil our fun. The Maestro doesn't get tripped up by fast rhythms either, unlike some past Audio Analogue products. It has the drive to make Major Lazer's Guns Don't Kill People…Lazers Do a real experience, and that's something many high-end machines, for all their resolution and obvious skill, sometimes fail to do. Switch to the Award-winning Cyrus CD XT SE+/DAC X+/PSX-R x2 combo, available for similar money, and you'll get even more snap, but the Maestro isn't far behind. This player is easy to underestimate. For all its scale and power it's a machine that doesn't knock your socks off, but give it time and it's a fine contender.